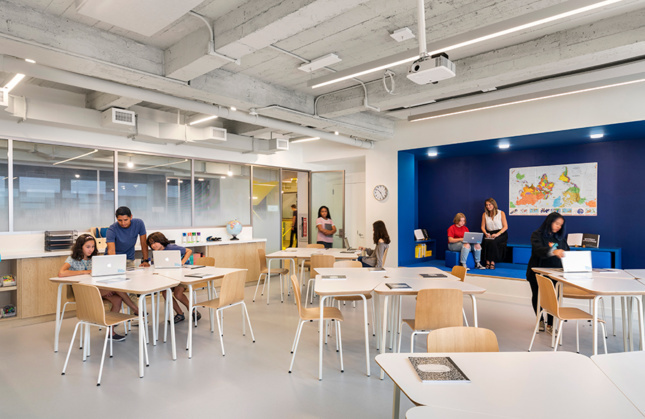 Rockwell Group’s design for the recently opened Blue School in New York City falls outside the lines of traditional design for primary and secondary education, especially in the cramped Big Apple. While the school includes many basic elements such as closed-door classrooms and a sizable cafeteria, the one thing the architects were expected to uniquely incorporate for the private school, which was founded by alumni of the Blue Man Group, is color. Lots of color. Stretched across four floors of a mixed-use, former medical building in Manhattan’s Financial District, the school serves as a “home away from home” for its kids, featuring flexible spaces and playful palettes that encourage creative self-expression and pride at all ages. 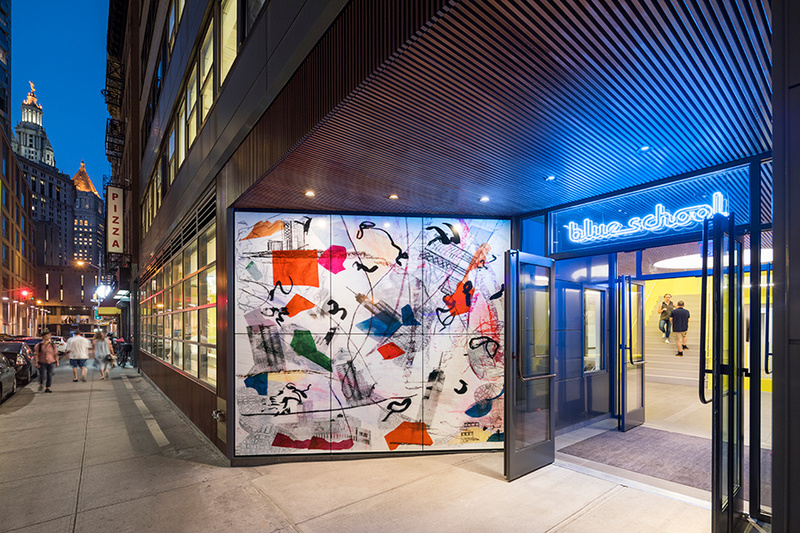 The Blue School opened last month for its inaugural semester, welcoming 100 students and 70 faculty members through its shiny glass doors under a neon sign signaling its presence in the neighborhood. The 45,000-square-foot facility is the New York-based institution’s second campus designed by Rockwell Group. 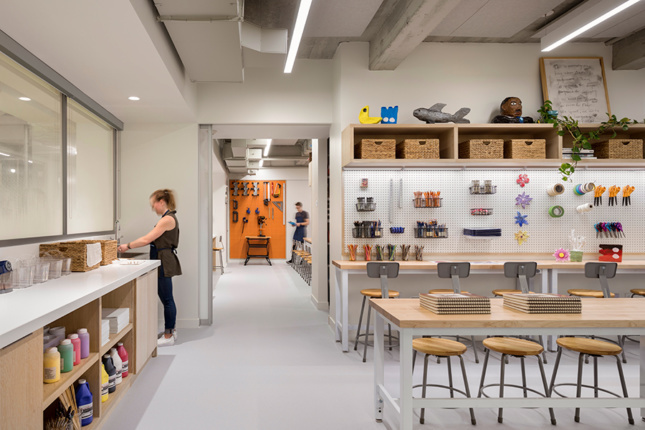 It provides much-needed breathing room for the school’s fourth through eighth-grade levels, which were previously housed in what’s now the primary school located in the South Street Seaport. Thanks to the move, pre-kindergarten through third-grade students were also given more space inside their facility, which opened in 2010. 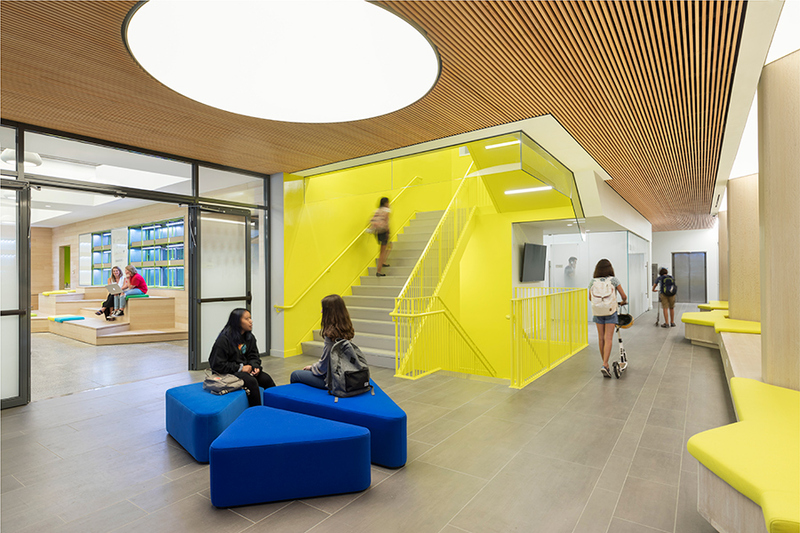 Upon walking through the doors of the new Blue School, students, teachers, and guests are greeted with a lobby sporting a lounge-like feel, as well a high-gloss, neon yellow central staircase that serves as the main point of circulation in the facility. 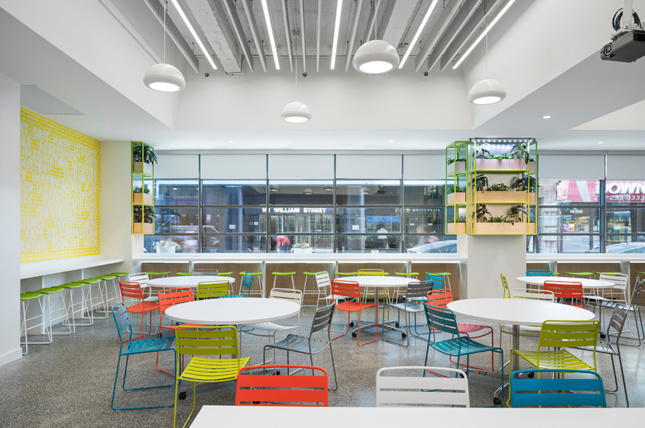 To the left in a community space called the Commons, colorful outdoor furniture adds a contemporary twist to the cafeteria setting along with bleacher-like seating wrapped in wood and staggered along the walls for a topographical effect. Additionally, a bar with stools lines the edge of the 1,800-square-foot space overlooking the street. The Commons also includes walls lined with LED-lit garden planters where food is grown as part of the school’s science curriculum as well as for students’ meals. The living wall is maintained in partnership with Brooklyn Grange and enhances the living room-like atmosphere of the shared space. 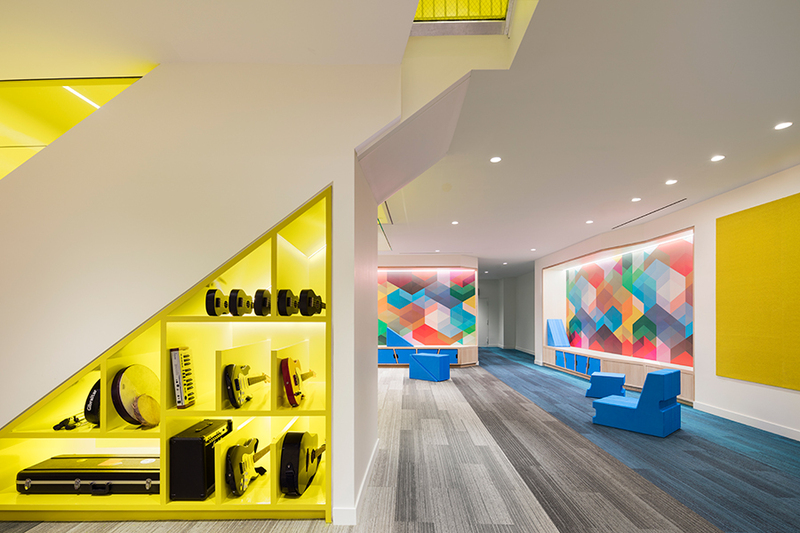 On the basement level, Rockwell Group created a grown-up version of their Imagination Playground system with which students can construct their own seating stations using shapely, blue-foam cushions. The surrounding walls are clad with colorful, geometric wallpaper by Flavor Paper. Two studios as well as a column-free gymnasium, which doubles as a 130-seat auditorium—the Blue School’s first ever performance space—were also designed for the school’s arts and exercise programs. If flexibility is an integral part of the Blue School’s educational philosophy and its interior architectural design, the concept is most evident on the top floors where each learning space includes key elements that allow teachers and students to take over space how they see fit. Rockwell Group collaborated with Uhuru to create non-directional trapezoidal desks that can be easily set up to form clusters for group-work situations. Each classroom also includes a raised carpeted platform dedicated to quiet reading or presentations. An art room, maker lab, and materials library were also given major space on the second floor. Both are fully stocked with every kind of arts and engineering supply imaginable, from paint brushes to saws, to glue and glass. An adjacent materials library—open to the kids at all times—serves several fields of study and specific STEAM courses. The Blue School’s library features a book-lined, double-height reading space with a massive sofa and custom common tables by Rockwell Group for Knoll. Hanging from the ceiling next to the curtain-wall window is a light sculpture designed in collaboration with Dot Dash Design. It changes colors throughout the day and amplifies the school’s interior at night. From the street level, passersby can see activity within the facility and students get a sense of inclusion in the bustling neighborhood. Since the Blue School began in 2006, it has added one grade level per year to its roster of students—hence the need to build out a new campus for its burgeoning population. The first group of kids to begin at the school recently graduated from 8th grade and though they never had the chance to move into the new Upper School, they were integrated into the extensive planning process that Rockwell Group held with students, parents, and teachers. The school expects the number of students to double over the next several years. Blue School will featured as an Open Access site during Open House New York this Saturday, October 13th. Check it out from 10 a.m. to 6 p.m. or go on a guided tour with representatives from Blue School and Rockwell Group at 11 a.m., 1 p.m., and 3 p.m. Reservations are not required.